The project originates from the presence of several trees in the square in the early twentieth century, in what has always been the heart of the city public life. 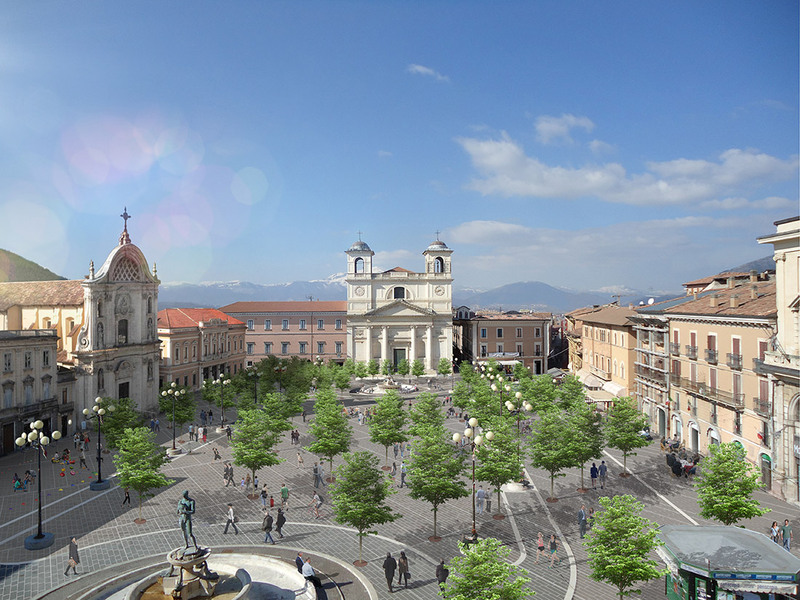 We believe this proposal can represent a synthesis between memory, future for L’Aquila. The trees presence, in fact, in addition to providing areas of shade and coolness during the summer, provides a natural stage set that changes through the seasons and gives a suggestive atmosphere for the benefit of those who live the space daily. The project preserves the possibility of carrying out the historic city market and provides a central open space for public special events. The proposal includes a memorial installation as well, a light installation with 309 LED lights (the number of the earthquake victims), paying homage to the victims of tragedy that hit the city in 2009. The city administration has decided to preliminarily submit the idea to the city and its citizens, to then bring the debate in the competent council commission, with all the institutional actors involved, also to develop all the aspects and present the project in all its details.